New electric cars at CSIRO Discovery Centre. Did you know wi-fi, penicillin, ultrasound scanners and Google Maps are all Australian inventions? What do you think are the most important discoveries that have been made by Australian scientists, engineers and inventors? Choose a great Australian invention or discovery! In 800 words or less, describe how the discovery came about, explain what it does, and discuss its importance – what does it mean for the world today and into the future? Enter the UNSW Bragg Student Science Prize and you can win a flight to Sydney and $500 book voucher. Plus every entry wins a copy of The Best Australian Science Writing 2016 for their school. Steven Hawking recently suggested a new space mission. How would the spacecraft be powered? How many legs does a scorpion have? What’s special about mistletoe: a) it’s a parasite, b) not all mistletoe berries are red, or c) it’s used to treat insomnia? Where is the Earth’s crust thicker: under the ocean, or on land? What’s the chemical formula for water? Put the socks on over the top of your shoes. Go for a short walk through the bush. Take a closer look at what has stuck to your socks. This seed has fine hairs and a spike. What features do your seeds have to help them stick to passing animals? Take off your socks and carefully turn them inside out so nothing falls off them. Go back to a desk or table to see what you’ve collected. Turn the socks the right way out and look at what is stuck to your socks. Use tweezers to pull interesting bits out of your socks so you can look at them more closely. Plants make seeds, and seeds make more plants. But plants don’t want all their ‘babies’ to stay close to home. They want to spread seeds far and wide! This tends to help young plants survive better. You may have found some seeds on your socks. Take a closer look. What features do these seeds have? Perhaps the seeds have spikes or hooks that helped them grip to your socks. This is a model of the way some seeds spread. Spikes or hooks on seeds stick to passing animals. The seeds attach for a while and then fall off, or are picked out when the animals stop to groom. This way of spreading seeds is called epizoochory [epi-ZO-OH-kor-ee]. There are many different ways that plants spread their seeds. Some trees put their seeds in tasty fruits, so they get eaten and pooped out somewhere else. Dandelion seeds are light and float in the wind. Coconuts float on the ocean and wash up on far away beaches, where they can grow into trees. Some plants have more active methods of spreading seeds – the sandbox tree has explosive seed pods that can throw seeds 45 metres away! 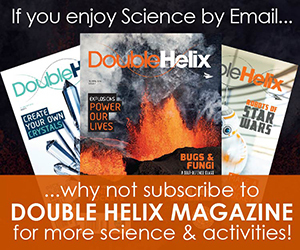 Find out more about exploding seeds in the latest issue of Double Helix magazine. Like these seeds, this issue is going off with a bang! Find out about volcanoes and the explosions that power our lives. Blast off with your own mini rockets and make an erupting volcano cake. 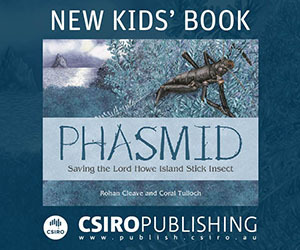 Buy your copy from CSIRO Publishing today! The spacecraft will have sails, powered by a laser on Earth. Scorpions have eight legs and two pincers. All three are correct. Mistletoe is a parasite that only grows on other trees. It can have berries of many colours including red, yellow and white. Mistletoe has also been used to treat insomnia. The crust is thicker on land (30–50 kilometres) than under the ocean (5–10 kilometres). Water is made of two hydrogen atoms and one oxygen, and is written H2O.